For my American friends. 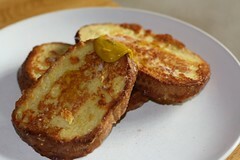 This is how I do French Toast – or eggy bread as we’ve always called it. The basic recipe is from Vegan with a Vengeance, but the finished item is sprinkled with black salt and served with a dollop of hot English mustard. Keep your minging fruit and sugar well away from my French Toast, if you please. I adore Reubens, any kind. 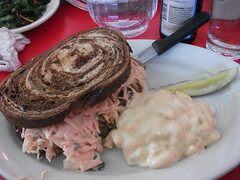 The picture shows the California Reuben from Chicago Diner, but the first Reuben I ever tasted was the Radical Reuben a few years ago. There isn’t really a tradition of Reubens in this country, even meat versions, so I don’t blame myself for wasting 36 years of my life without this amazing discovery. 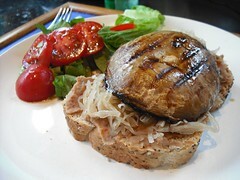 You’ll definitely need a knife and fork for the version in American Vegan Kitchen which uses seitan and is fabulous. In testing there was a great fresh kraut to go with it which didn’t make the book, but Tami’s put it on her blog for you. There’s even a hidden version in the appetizer section called Deli Reubenettes, which have all the flavours of Reubens but are wrapped in pastry. I’ve definitely got my eye on this version recently posted by Isa, too. Have you got any other great Reubens for me to try?